At the heart of the Urals’ souther steppe lies a series of villages with European names and replica landmarks. Although the names of Berlin and Paris may seem out of context in the Urals, these islands of Europe are hundreds of years old and commemorate Russia’s long involvement with its western neighbours. Paris, Fere-Champenoise, Berlin, Leipzig, Varna, Cassel, Port Arthur and a whole host of hamlets on the Chelyabinsk Region map bear European names in honour of the Russian victories in Germany and France in the campaigns of 1799 and from 1813-1814. After returning from the far reaches of the Russian empire, returning orthodox Cossack reinforcements named these settlements. These geographical mismatches are not just symbols of military pride, they are also a fascinating place to visit. Journeying from Paris to Berlin on the Ural roads takes a whole day, and taking a private car with a local guide is recommended. In Ural Cassel it may not possible to sit in a pub and drink a mug of Bavarian beer, neither is it possible to attend a haute couture show in Ural Paris. Instead, calm village life prevails with furnace heating, low wooden huts, dusty country roads, quaint churches and the captivating Ural natural environment. The Ural European hamlets are distinguished by their street layouts which were designed by the Cossacks to be part of a fortified settlement. In the Ural European hamlets, tourists will not encounter the luxuries enjoyed in their European counterparts. However, they will certainly be able to escape form the urban hustle and bustle and experience some fascinating villages with their own particular way of life. A real highlight of any trip to the area will be a chance to meet the enchanting NaÄaybäks, a small ethnic population which appeared after the christening of the Tatars. They fought in the Patriotic War against Napoleon and entered Paris in 1814 with the Russian army. The NaÄaybäks are very hospitable and welcome tourists to share their traditions and culture as well as culinary secrets! The first encounter with the NaÄaybäk people can sometimes cause surprise. Despite having Russian names they speak NaÄaybäk a dialect of the Tatar language. Although they classify themselves as Orthodox Christians, they celebrate pagan rituals much to the derision of local priests. On the anniversaries of the death of their relatives, the NaÄaybäk organise large wakes and make sacrifices. Once a year they also prepare a bath for Maundy Thursday which is believed by the NaÄaybäks to be the day in which their ancestors’ souls are cleansed. Aside from these rituals the NaÄaybäks also have a peculiar cuisine with a favourite dessert being cherries in oil with sugar. In 2012, 200 years after the battle with Napoleon, the NaÄaybäks retraced their steps and went to conquer Paris again. Travelling overland through Poland, Germany and France, the NaÄaybäk delegation passed through the same European settlements that their Cossack ancestors had once conquered. Parisian officials could not meet the group, but the mayor of Arcis-sur-Aube received the NaÄaybäks but made a debatable assumption: “You are the first Russians to come to our town after Tsar Alexander I in 1814”. 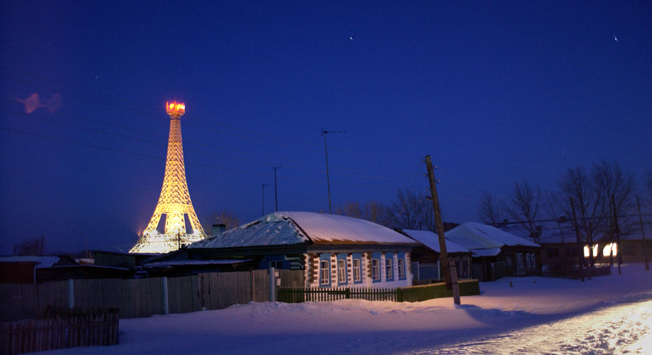 The Ural village of Paris has only two and half thousand inhabitants, and was founded 170 years ago as a post of the Orenburg Cossack army. The name of the French capital was given to it to commemorate the Russian army’s arrival into Paris after defeating Napoleon in 1814. Despite its rural location, the village has taken up some of the spirit of France with locals often travelling by bike and the local salon named ‘the French Lady’. On the central square stands Russia’s biggest and most accurate replica of the Eiffel Tower. The 50 metre Ural twin is one sixth of the size of Paris’, 160 times lighter and instead of a viewing platform, serves as a telephone mast! The sign at the base of the structure reads, “the tower was erected in honour of Russia’s victorious troops”, a reference to the war of 1812. Nearby there is also an Arch de Triomphe which is unfortunately too small for trucks and tractors to pass through. So novel has Paris become that the village’s budget has had to allocate special funds to replace the signs which tourists remove and take with them as souvenirs. One mile away from the border with Kazakhstan, 110 miles miles from Chelyabinsk, lies Berlin village. Founded 270 years ago as a military settlement of the Orenburg Cossack army, the Trinity Fortress was built here with outposts, redoubts and cordons. The small Ural village was given its name to commemorate the Russian army taking Berlin in 1760, during the Seven Year’s War in 1756-1763 and during the Patriotic War against Napoleon in 1813. The clay houses found here have be around for centuries, somehow resisting the assault of nature and managing to hold up the weight of their roofs. Today there are as little as 1,000 residents living in the Ural Berlin who are mostly self-sufficient farmers. Tourists venturing this far should make sure to visit the local Berlin Wall which is the village’s very own version of the wall which divided the German capital for nearly 30 years. The biggest and most beautiful village in the Ural Europe is Varna, often called the jewel of the southern Urals. The village takes its name from the Russian conquest of the Bulgarian fortress of Varna in the Russian-Turkish War of 1828-29. Varna is a famous village known across Russia and synonymous with Cossack culture. The village’s population of 10,000 is diverse with Russians and Kalmyks, Mordvins and Ukrainians, Belarusians and Tatars living side by side. Despite the proximity of these different cultures and nationalities, the people of Varna live harmoniously. Around a mile from Varna stands the 17 metre Tamerlane Tower, a medieval Muslim monument from the 14th century. According to legend, it was built by the famous medieval Central Asian conqueror Timur Tamerlane on the grave of his daughter who had fell in love with a common warrior and eloped with him. Her father had caught up with the renegades and, in a rage of fury, executed his daughter’s lover. Stricken with grief and feeling unable to carry on, his daughter tragically committed suicide. Today the Tamerlane Tower is a cult site, visited by newlyweds who tie their kerchiefs around the gates as a sign of love and fidelity. One mile northwest of the Naila village in the Chelyabinsk region is the fascinating French mountain where ruins of a so called French Castle can be found. The French Castle is in fact the name for the central part of a French factory which from 1878 to 1915 enriched asbestos. The Tsarist government rented out some land to a French franchise, granting it the right to extract useful resources. Unknown to the authorities, the French surreptitiously mined gold ore on the Miass River which they then concealed in troves concealed in the factory’s niches. All that is left of the factory are the ruins of some structures and the flooded mine holes. There is still a road which leads to the top of the mountain as well as a path to the forest leading to deposits of ornamental stone. Those who reach the top of the mountain are rewarded with an impressive panoramic of the Miass River valley and the Ilmeny mountain chain.